Planning a wedding in Vail Valley is an awesome choice, however, one thing to think about is hiring locally. Lots of couples opt for an out of town photographer; they may be from the Denver area or even flown in from the bride or groom’s hometown, but choosing a photographer from another area can be a disadvantage, as they are unfamiliar with the area and local weather patterns. I know what you’re thi nking, “So what?” right? Well it may seem pretty irrelevant but trust me; this little factor can have a pretty solid effect on your most precious memories. I’ve called the Vail Valley home for quite some time now and I’d like to say that I have a definite advantage when it comes to knowledge on photographing a wedding in these beautiful mountains. Unfortunately, someone from outside of the area isn’t going to be familiar with the Vail area – especially the fact that the mountain weather patterns in the summer are very unpredictable. You need a professional photographer who is aware of the little details like this and comes prepared. Putting aside the fact that I never photograph a wedding without at least a couple of umbrellas handy, I’ve also been doing this long enough to know how and when to capture that perfect lighting. Believe me when I say, you’re going to want a photographer who will see the clouds rolling in and not miss a beat. An out of town photographer could spook very easily in a situation like this and encourage you to take your photo shoot indoors. That’s not what you’ll get here; it’s your wedding and if you’ve always dreamed of an outdoor wedding in the beautiful Vail Valley, Colorado, a few clouds here and there shouldn’t stand in your way. In fact, you may just find that they add a little something special to each shot – at least that was the case for one couple I had photographed. 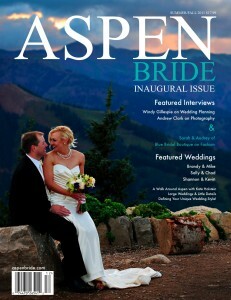 Their photo even ended up on the cover of Aspen Bride! There is no question that any of the out of town photographers that you may be considering are talented, but sometimes you just need a little something more than that. A local photographer, like myself, is familiar with the area and will know how to use that extra bit of information to capture those moments that will take your breath away.